The best outdoor paintball in MN and WI! Looking for a fun kids birthday party idea? 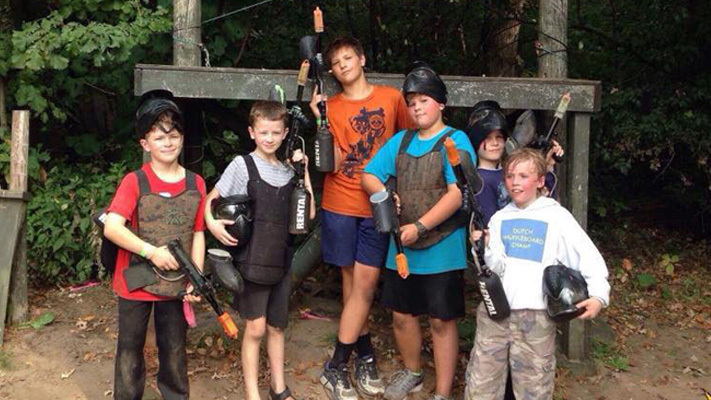 Splat Tag Paintball Park provides a great opportunity for birthday party groups to play outside in a wooded, natural setting as they work together as a team to capture the opposing team’s flag. Private games may be booked for players as young as 8 years old. Bring your birthday cake and grill your lunch outside. We’ll provide the picnic tables and a grill! Additional paintballs may be purchased. We take private groups from 8am to 10pm. We have some lit courses for night games. Some times maybe limited. We take private groups all year long. Deposits may be refunded with no less than 5 days notice. We are open rain, sleet or snow, but you have the opportunity to take a rain check with any reason whatsoever provided you notify us at least 2 hours prior to your start time. No hidden costs. Air HP refills included in package price. $100 deposit for booking covers everyone in your group. Players may be added or subtracted right up until your start time, as long as you have a minimum of 8 players. For children and first time players, Splat Tag offers a paintball experience at a lower intensity. A low intensity game is offered by providing players with guns that fire smaller paintballs as a slower velocity. Splat Tag has private playing fields 15 minutes from the Splat Tag field, located in Baldwin, WI. If you are looking for a special VIP private paintball game opportunity, please contact Splat Tag for more information. Splat Tag has soda, bottled water, chips and candy avilable for purchase. Food available Saturday and Sunday only. Splat Tag also has grills on-site for customer use. No alcoholic beverages allowed. © 1996-2018. All rights reserved. Splat Tag™, Paintball Park™, Giant Big Game™, Giant Game™, Giant Course™, Jungle Rumble™ are all trademarks of Splat Tag, Inc. USA.